Florida Sen. Marco Rubio visits Meet the Press to discuss bipartisan immigration reform legislation in the works on Capitol Hill and the gun control reform efforts concurrently taking place. >>> this sunday a critical phase for the obama agenda -- guns, immigration , and can gridlock in washington be broken? 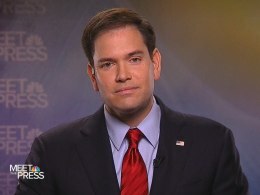 my lead guest is the key gop player in the immigration debate , florida senator and prospective 2016 presidential candidate marco rubio . >>> also had morning the gun debate. high emotion as newtown families fight for tighter gun restrictions. what chance does a new compromise on background checks have are in a divided congress? >> what's more important to you? our children 0 are or an "a" gra grade? >> part of our political roundtable, with us democrat from new york senator kirsten gillibrand and republican from utah, senator mike lee . >>> finally, jackie robinson , baseball and race in america a. new film about his life is out this weekend. why his story is so meaningful even to a younger generation in the age of president obama . joining us for a special conversation jackie robinson 's wife of 26 years, rachel robinson , and historian and documentary filmmaker ken burns . >>> and good sunday morning the excuse my laryngitis. on tuesday a bipartisan group of senators will present its long long-awaited plan for immigration reform , the so-called gang of eight, has wrapped up months of negotiations and will present a bill that includes a pathway to s citizenship for many of the 11 million immigrants who are here without documentation. with us now the man at the center of bringing this group together, republican senator from florida, marco rubio . senator, welcome back to "meet the press." >> thank you. thanks for having me. >> i have to apologize for sounding like peter brady from "the brady buncbunch" this morning. so bear with me. >> i just thought were you getting emotional. >> let's get to immigration and the so-called gang of eight. if we were to sum up this proposal it would be to beef up border security , at the same time create a pathway to citizenship for illegal immigrants now in the country. why would you support this given the obvious political risk that this carries in your own party ? >> well, three things. first of all, even if we didn't have a single person in this country in violation of immigration laws , we could still have to do immigration reform because our legal immigration system is broken. it's not good for anybody the way it works right now and this bill modernizes it in a way that will get broad based support. we also have to be able to enforce our laws. and this bill will pass -- this bill once introduced as we've agreed to, i think, will show a broad base of enforcement measures unlike anything this country has ever seen. and what it does, it creates a way for us to address the millions of people that are here undocumented in a way that's compassionate but also in a way that's responsible. it will allow them to ultimately earn access to our legal immigration system. they will still have to apply. it doesn't award them anything, but it does give them access to our legal immigration system, to a process that will not encourage people to come here illegal willy in the future, and through a process that isn't un unfair for the people who have done it the right way. you talk about the political calculus, i have avoided making the political calculus on this issue because for me, and this may sound new to people, what have you,terms of how politics works today, but what we have now isn't good for anybody. what we have in place today, the status quo , is hobble for america . the only people benefiting from the status quo in immigration today are people trafficking human beings across the border and the people hiring illegal labor for cheap purposes, you know, to pay them very little. these are the only people benefiting from the status quo . it's bad for everyone else. >> as you well know and the criticism is fast and furious from conservatives like ted cruz , your fellow senator, for those who are going through the legal process , they'll feel like chum ps who are outside this country. his words. because those here illegally would get on this legal path to citizenship even if they would pay a pent, even if they would pay a fine and have to go through other checks. why isn't it tantamount to amnesty as your critics say? >> well, first of all a.mnesty is the forgiveness of something. in fact, there will be consequences for having violated the law and reasonable consequences. but the type of consequenceses that ensure that there's no incentive to do it this way again. here is my second point. if you're waiting to come legally to the united states now, no one who has done it the wrong way will get it before you. it will be cheaper, faster, easier and less bureaucratic if you are doing it the right way. in no way having done this the wrong way be a reward in comparison to the people who are waiting to come here legally or the ones who have come here legally in the past. so i can't wait for the details of this to be available because i think people will find we've addressed that concern specifically and effectively. >> three years ago in a debate you were clear on this. you said to earn a pathway to citizenship you would have to leave this country if you were here illegally, go back home, and then you could come back in. you said an earned pathway was amnesty. yet you've changed your mind here. why? >> well, first of all, what i said throughout my campaign was that i was against a blanket amnesty and this is not blanket amnesty. this is not blanket anything. it's not amnesty because you pay serious consequenceses for having violated the law. third, we need to understand the existing law. the existing law does not prohibit someone from violating the immigration laws from getting a green card . it simply says you have to leave the united states and you have to wait ten years. what we have done is created an alte alternative to that that forces you to wait more than ten years, that forces you to pay an application fee, that, forces you to pay a significant fine, that forces you not to qualify for any federal benefits of any kind, that tells you you have to work and be gainfully employed so you are not a public charge. even with all of that, you don't gain access to the green card process. you have to apply for it. it's not award ed to you. you don't gain access to any of that until there's a universally verified system in place and an exit system in place. >> there's a change. you said that you would have to leave the country before you could come back, and you've changed on that. >> but that's not necessarily what i've said in the past. what i've said in the past is there is a the pathway to citizenship and that is the legal immigration system. and all this bill does is give people access to the legal immigration system. it allows them to earn an access to the legal immigration system. and so what we are doing is we are creating an altern it tetch to that path that exists now and quite frankly it will be cheaper, easier and faster to leave and wait ten years than to go through this process that we've designed. >> the political problem the party faces, republicans face among minority communities, is so large if you look at the results from the 2012 election. you've spoken to it as have others and i wonder whether this is enough, the party 's repositioning, your leading the way is enough to overcome those difficulties. colin powell was on the program earlier this year. he had some comments about the plight for the republican party and i want to get your response to them. >> i think what the republican party needs to do now is take a very hard look at itself and understand that the country has changed. the country is changing demographically. and if the republican party does not change along with that demographic, they're going to be in trouble. there's also a dark -- a dark vein of intolerance in some parts of the party . what do i mean by that? what i mean by that is they still sort of look down on minorities. >> do you agree with that, and do you think that these efforts on immigration are enough to overcome it? >> well, first of all, i don't agree the republican party characterized by intolerance or looking down on anybody and i respectfully disagree with someone i think has served our country admirably. obviously there's political ramifications to everything we do in washington, but it's not the rein to do it and it certainly isn't the reason i'm involved in doing this. i'm involved because i think what we have now is terrible for the united states of america . we have a legal immigration system that does not work. it does not reflect the economic needs of this country in the 21st century . it needs to be modernized and our agreement will do that. it will modernize the legal immigration system that is more merit based and jobs based and less based on whether you know someone who already lives here and that's an important development along with the ability for people to access is the workforce in the high-tech field, et cetera . the second thing this does, it puts in place effective enforcement mechanisms unlike anything we've ever had in the history of this country before. my last point on this, i think republicans need to do a better job reaching out to everyone in the united states . politics is always about getting the support of the majority of our people. and i think the best way to do that is is for the republican party to prove, as i think we can, that we are the party of upward mobility . we are not the party of the people who have made it. certainly we don't begrudge people who have made it. we secelebrate what they have done. in america we've always celebrated success. but we are the party for the people trying to make it, who are trying to start a business out of the spare bedroom of their home who are trying to give their kids a better life . and the only way that's possible is through the american free enterprise system the democrats on the left are undermining. >> isn't the hole rather deep? based on our recent poll, favorable/unfavorable ratings among hispanics in this country comparing you to hillary clinton here, look at her at 63%/13%. you are at 23%/12%. isn't that a sign of just how big the hole is even among hispanics in the country between you and top tier of democrats? >> i don't know anything about these polls. and i quite frankly don't spend a lot of time analyzing them. this isn't about improving anyone's poll numbers. this is simple. i'm a senator. i get paid to solve problems. we have millions of people in this country who are illegal ly here. we don't know who they are, where they are. many of them aren't paying taxes. it's not good for them obviously either. it's not good for our economy. we have a legal immigration system that our business community is telling us is keeping them from creating jobs that can lead to economic growth . >> we have immigration laws that aren't being enforced. >> there's something that happens in this debate, the amendment process, additional opposition from conservatives that causes you to step back and say, i can no longer support this compromise agreement . >> well, i've been very clear about my principles of what reform needs to look like, and if this bill were to somehow ab abandon those principles, certainly i wouldn't support that. i don't anticipate that. there are amendments, designed to make a bill better. i think that's important. what we are working on is a starting point. it snos the take it or hev it. we spent a lot of time crafting it. i think it's a very good piece of legislation, a very good law. there are 92 other senators who have ideas of their own, and i think that from them we are going to get ways to improve this. we are going to get ideas that make it better and i welcome that. there are amendments designed to undermine this, that will be designed to make this thing undoable. and obviously i'll oppose that especially if that's the intent of them. so certainly i'm looking forward to an open process of debate on this. >> i want to get to a couple of other issues including the gun control debate. striking moment this weekend when you had one of the family members of the victims in newtown actually give the weekly address that the president normally gives. wheeler had this to say. i want to play a portion of it and get your response. >> we have to convince the senate to come together and pass common sense gun responsibility reforms that will make our communities safer and prevent more tragedies like the one we never thought would happen to us. >> how do you answer francine wheeler when you are opposed to expanding background checks , when you voted even to oppose this debate coming forward in the senate? >> well, first of all, let the me say my heart, as everyone else's, goes out to these families. i actually met with these families including her and her husband. it was, i can tell you, the most emotional meeting i've ever had in my service. i admire these families because, quite frankly , their agenda is not a political one. they are trying to turn this horrifying tragedy into a positive in terms of getting changes in public policy , and i applaud them for that. here is my point and has always been my point on gun laws . they are highly ineffective in terms of accomplish the following goal and that is to protect the right of law abiding citizens to possess weapons which the second amendment guarantees, the constitutional right, and they are ineffective at keeping guns out of the hands of dangerous criminals who quite frankly because they're criminals don't care what the law is. so i'm not opposed to all gun laws . i'm just opposed to the ones that don't do those two things, don't protect the right to keep firearms. >> don't you need to be challenged? >> i don't think these accomplish that. >> there are checks at the federal level . this would expand those checks in order to shore up certain loopholes. how is it that those additional checks would undermine the second amendment? >> well, first of all, we have, for example, concealed weapons permits across the country. i have one. these are people that are preapproved in terms of getting concealed weapons permit. perhaps there's a way to accommodate that across all 50 states where concealed weapons permit is treated as a de facto background check . ultimately the reason we are doing this, in essence we are spending all of our time talking about background checks as if criminals will no longer get guns because they have to undergo a background check , we're lying to people. that isn't true. the fact of the matter is we have a violence problem in america . guns are what people are using, but violence is our problem and no one is having a debate about the violence problem. and i think this is a missed opportunity to have an honest and open conversation in this country about why these horrifying things are happening. not simply what they're using to carry this out but why are people doing this to it begin with and all the focus is on laws that only law abiding people are going to follow. >> you know the political analysis right now as a pro-suspect issive 2016 nominee, you have to be careful not to stray too far from the republican party on guns particularly when you're stepping out trying to be a leader on immigration . you have to pick your areas where you're going to stand out. >> david, i disagree with that. my position on guns is the same as they've always been. the second is amendment is a constitutional right. i didn't write that. that's in there. anytime you're going to do anything that impacts a constitutional right, the scrutiny should be very, very high. and that's what i'm applying to th this. if someone can produce a law that keeps guns out of the hands of criminals but protects the rights of law abiding citizens to possess them and doesn't infringe on those rights, i would support that. i haven't fully read the toomey/manchin compromise but all the proposals do not reach that. we are miss iing a golden opportunity to have an important debate about violence in our society. violence in our society is the problem. >> i want to ask you about north korea can as the administration waits for a potential missile launch from kim jong -un. how do you think the admission has handled it? how do you defuse this crisis? >> i don't have much qualms with the way they've handled it, to be quite frank. i think they've taken the right steps to protect the united states and to make very clear that we are going to live up to our security obligations to our allies in the reswron. the truth of the matter is that i think it's a mistake to view north korea can as a government. it is more like a criminal syndicate . and this young man now in charge of government there is even more erratic, as hard as it is to believe, than his predecessors. it's a very dangerous situation. i'm glad to see secretary kerry visited china yesterday. i think it's important that the chinese weigh in on this. i think in the long term it's the goal of everyone to see a unified korea that actually provides for the people of north korea , the kind of life that they need. i think certainly in the short term what we have to ensure is all of our allies in the region clearly understand that we are going to live up to our security commitment, that we are position ed militarily to defend the united states if, in fact, these guys carry out an irrational act and long term to make them understand that this pattern of irresponsible behavior followed by some sort of reward in the form of food aid that those days are over and that is what's important, that we not reward that behavior with any sort of aid. >> you were critical of the administration after a trip down to cuba by beyonce and jay-z. they were seen vacationing there, walking through the streets. it was sanctioned by the treasury department . isn't the broader issue here, senator, what, if anything, will it take to get more normal relations with cuba and the united states ? >> well, that's up to cuba . if cuba wants normal relations, there are certain things they need to do like become a normal country that respects the rights of their citizens. i thought it was hypocritical of beyonce and jay-z to go down to cuba . there is a rapper on a hunger strike and has been persecuted because of his lyrics. jay-z wears a shirt of a man who was a racist and a killer. he's not in the middle of any public discourse here. it's important to point out when people take stances like that that are absurd, beyond that the fundamental problem is not jay-d and beyonce . the problem is these trips to cuba are being abused. they are not people to people trips, they are tourist trips that provide a currency for a tyrannical regime at that get hard currency . that's why the trips need to be ca carefully cruet nized. >> final question on politics, can a nominee of the republican party in 2016 be a champion for an immigration reform policy that provides a pathway to citizen for for illegal immigrants in this country? >> i think the nominee in our party needs to have answerses to the problems our country faces and immigration is a serious problem. the supposed 11 million people here undocumented is not a theory. no one is talking about bringing 11 million people here illegally. they are here now. they are here for the rest of their lives. if someone believes we can round them up and deport them, they should advocate that. i don't think that's a reasonable goal. if someone thinks we should make life miserable for them so they self-deport, it doesn't work. we can leave things the way they are, status quo , and that is amnesty. or try to address it in a way that's responsible and that's what i'm attempting to do and what i hope i can convince my fellow republicans to be supportive of. >> senator, thank you as always. thanks for not making fun of my voice. >> and coming up here after a personal plea from the familiar had lis of newtown victims this week, new gun control legislation moves forward on capitol hill . but will controversial measures like expanded background checks get through a divided congress? joining me for debate democratic senator kirsten gillibrand of new york and republican senator from utah mike lee .